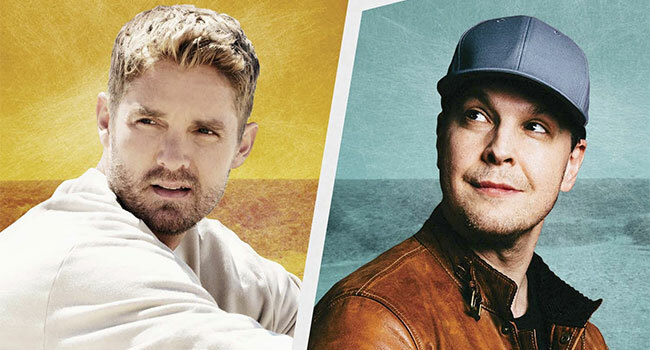 In advance of multi-platinum selling artist Brett Young’s triple play in Los Angeles (Saturday, March 23rd – Monday, March 25th at The Novo), the “Here Tonight” hitmaker will once again collaborate with Gavin DeGraw, uniting for a co-headlining show at The Joint in Las Vegas on March 22nd. Young and DeGraw’s friendship spans over a decade, they have been integral parts of each other’s lives with DeGraw even co-writing and singing on Young’s autobiographical “Chapters,” featured on his Ticket To L.A. album (BMLG Records), but this is the first time they will share the stage as co-headliners. Tickets are already on-sale to the general public at brettyoungmusic.com. Young’s current single, “Here Tonight” continues its ascent on the country charts this week, highlighting his “California-rooted smooth rock groove” (Nashville Lifestyles). Co-written alongside Ben Caver, Justin Ebach and Charles Kelley, “Here Tonight” has over 65 million streams in the US. ACM New Male Vocalist of the Year Brett Young’s sophomore release Ticket To L.A. debuted atop the Billboard Country Albums chart and follows his platinum self-titled debut, which dominated the Top 20 on the Country Albums chart for 37 weeks. Delivering four consecutive No. 1 platinum-certified hits, Young was named ASCAP’s 2018 Country Songwriter-Artist of the Year for his “melodic craftsmanship” (Billboard). He has also garnered nominations from ACM, Billboard, Teen Choice, CMT and CMA Awards as he continues to rack up nonstop hits as “one of country music’s most reliable new hitmakers” (Tennessean). Following his current headlining dates, Young is set to join Kelsea Ballerini on the Miss Me More Tour. He will also perform at multiple festivals throughout summer including stops at LakeShake in Chicago, IL on June 22nd and Faster Horses in Brooklyn, MI on July 19th. Gavin DeGraw is a multi-platinum selling singer, performer and songwriter. He first broke through with the 2003 release of his debut album, Chariot, which sold over one million copies, earned platinum certification, and yielded three hit singles: “I Don’t Want To Be,” “Follow Through,” and the title-track, “Chariot.” DeGraw’s self-titled second album debuted at No. 1 on the digital sales chart and at No. 7 on Billboard’s Top 200 album chart in 2008, earning Gavin his first Top 10 album. It spawned the hit singles “In Love With A Girl,” which Billboard dubbed “a rocking home run,” and the gold-certified “We Belong Together.” In addition, DeGraw was nominated for his first Grammy for “We Both Know,” the song he co-wrote with Colbie Caillat for the 2013 film, Safe Haven. Since then he has been consistently touring around the world, including sold out dates with the legendary Billy Joel, and hit a milestone with the release of his first greatest hits compilation titled Finest Hour.